When Dr. Aditi Agarwal moved to the United States, she had already attained her dental degree and practiced general dentistry in India. In order to master the science of dentistry as taught in the United States, she went back to school and she earned her D.M.D from Boston University in 2003. Since then, Dr. Aditi Agarwal, has been part of a large group practice in Washington where she has earned the respect of her peers and the trust of her patients. Dr. Agarwal is excited to bring her years of training and experience to her beautiful new practice “Avondale Smiles” in Redmond, WA. She understands that families are busy and have limited budgets, so she chose a convenient location for her office, and made sure to include evening and weekend hours. Avondale Smiles is insurance friendly and offers flexible financing options. Dr. Aditi Agarwal lives in Kirkland with her husband Rohit, their son Arnav, and their dog Dino. 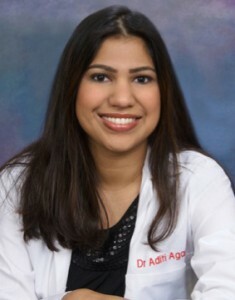 Dr Aditi likes to travel, read and enjoys listening to music. She volunteers her time to various social services as she strongly believes in giving back to the community. She is an active member of the American Dental Association, the Washington State Dental Association and the Seattle King County Dental Society.